BEFORE WE CONSIDER the age of trees, it is well to learn the secret of how they record their age. Just between the bark and the wood of a tree, there is a thin layer of cells known as a "cambium." The cambium is the growing tissue of a tree. It covers the top and sides of the wood of a tree like a thimble. Each year the cambium forms bark on the outer side and wood on the inner side. These annual rings are wider in the early life of a tree, and much smaller as the tree grows older. The size of the tree, therefore, is not always an accurate guide to its age, as the annual ring of wood may vary in width according to the difference from year to year in climatic conditions. Thick rings indicate favorable seasons and prosperous growth, and thin rings record years of excessive drought or cold and consequent stunted growth. Two Redwoods of approximately the same size were cut in the same forest; one was 1,300 years old, and the other, 2,300 years old. Special instruments now make it possible to count the rings of small standing trees. It has not been practical, however, to make accurate counts of the rings of the larger living trees, such as the Redwoods. The age of most living Redwoods therefore cannot be definitely determined, but must be estimated by making comparisons with trees that have been cut down and their rings counted. In order that we may more fully appreciate the age of the Redwoods, we shall compare them with some other kinds of trees. Pinesthe story of the "Thousand-Year Pine. "Many of the Sugar Pines growing in the same forest with the Sierra Redwoods have reached an age of from 300 to 500 years. I have counted the rings of two stumps, which were five feet in diameter and more than 300 years old. The Giant Yellow Pine in Yosemite Valley which was killed by beetles in 1933 is still standing and is thought to be about 400 years old. Enos A. Mills, the well-known nature-lover who lived for many years in Estes Park, Colorado, used to tell the story of an old Yellow Pine which he called the "Thousand-Year Pine." This tree grew within sight of the cliff-dwellers' Mesa Verde, which stands near the corner of four states. The tree was cut down in 1903, and Mr. Mills made a study of its life record. He found that it had some interesting stories to tell. "Although lightning had given it a bald crown [he writes] it was still a healthy giant and waving evergreen banners more than 115 feet above the earth before it fell. The massive trunk was eight feet in diameter at breast high." In the base of the trunk, Mr. Mills found 1,047 rings of growth. In sawing off a section of the lower part of the tree trunk, the saw struck something hard, which upon examination proved to be a flint arrowhead. Another was found near by. The conclusion arrived at was that, in 1486, an Indian standing near the tree shot an arrow into it which imbedded itself in the trunk. No one knows whether the Indian was aiming at a bear that stood at bay backed up against the tree, or whether the arrowhead might be the lasting record of a battle between Indian tribes. Mexican CypressMexico's oldest tree.The Mexican Cypress (Taxodium mucronatum) ordinarily does not attain an age of more than from 1,000 to 1,500 years. There is a tree in the State of Oaxaca, Mexico, however, called "The Big Tree of Tule," which is thought by many to be the "oldest tree in the world." It has a diameter of 40 feet at the base. Some authorities would say that the tree is at least 4,000 years old, and several have estimated its age at 5,000 years. Although the Mexican Cypress belongs to the Redwood Family, this particular tree appears to be an abnormal specimen of its kind, since no other trees of this species even approximate its size or age. Cedarsnatives of the Eastern Hemisphere.There are no true cedars native to North America. Several kinds of trees grow in America which are called "cedars," such as the Junipers, or Red Cedars, of the eastern United States, and the Canoe Cedar and Incense Cedar of the west. There are only three species of true cedars in the world, the Cedars of Lebanon (Cedrus libani) of Palestine, the Deodar Cedars (Cedrus deodara) of the Himalaya Mountains, and the Mount Atlas Cedars (Cedrus atlantica) of northern Africa. Solomon used Cedars of Lebanon in building his temple at Jerusalem. Many of the true cedars have been planted in America, especially in California. The mile-long avenue of living Christmas trees of Altadena, California, is composed of Deodar Cedars. Some of the Cedars have been known to attain an age of 2,000 years. Junipers.Junipers belong to the Cypress Family, a group of evergreen trees which are found throughout America. They are popularly called "Cedars." Because they often grow at high elevations, where storms are prevalent and where the soil is thin, it has long been known that they are very tenacious of life. From Waldo S. Glock, of the Carnegie Foundation (his article on "Observations on the Western Juniper" appeared in the January, 1937, issue of "Madroño: A West American Journal of Botany," we may now learn some details about their age. 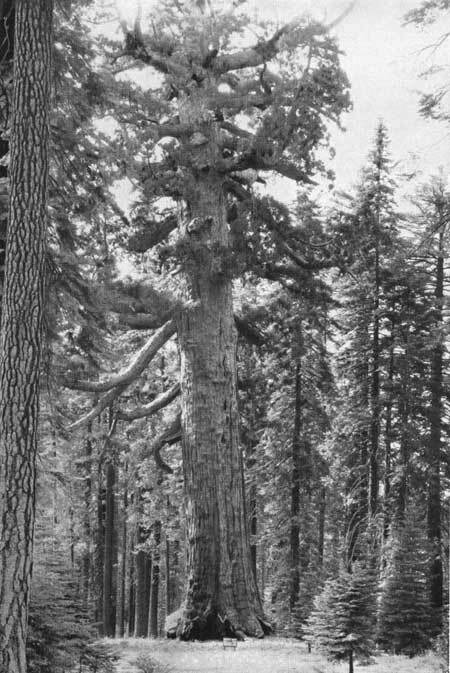 Of the western Juniper, he says: "The longevity of the species certainly equals that of the Coast Redwood and in a few instances rivals that of the Giant Sequoia." Studying some Junipers southeast of Lake Tahoe, in Faith and Charity valleys, he found that "those from which core samples were taken gave evidence of being between 900 and 1000 years old." One tree studied is known as the "Bennett Juniper," the largest Juniper of which there is any accurate record. It is 80 feet tall and its greatest diameter, at the ground, is 21 feet, 6 inches. The diameter five feet above the ground is about 14 feet. An exact determination of its age could not be made, but Mr. Glock says: "From the data at hand, a fair estimate in round numbers . . . is 3000 years. There can be little doubt that the tree is well over 2000 years old, since the outer foot of the trunk averages seven hundred rings." Coast Redwoodas old as Christianity.The Coast Redwoods attain a great age. Published statements to the effect that they reach an age of 5,000 years are not justified by the facts. Authentic records do indicate, however, that at least some individuals reach the age of 2,000 years. The average age of mature trees of this species is from about 800 to 1,500 years. Sierra Redwoodthe world's oldest trees.The Sierra Redwoods (Sequoia gigantea) as a class are no doubt the oldest living things in existence. A wedge-shaped section of a comparatively small tree which has been placed in the Mariposa Grove museum for demonstration purposes, shows by actual ring count 1,830 years of growth. The tree was about 15 feet in diameter. In order that the age of this tree may be better realized, certain pen sketches, pictures, and redwood seed and seedlings have been placed in the Museum at each side of this section. The tree lived for 268 years after the landing of the Pilgrim Fathers. Saint Paul in prison, A.D. 58 Seed germination. The most critical stage in the life of a Big Tree. Destruction of Pompeii by Vesuvius, A.D. 79 Seedling stage, 21 years. Young Big Trees differ from older ones in having gray bark and sharp leaves. Invention of paper making by Chinese, A.D. 120 (approx.) Sapling stage, 62 years. Pointed tops and rapid growth indicate sapling stage and youth. Destruction of Rome by barbarians, A.D. 410 Youth, 352 years. The wide spacing of annual rings just below this point indicates a series of favorable years. First Crusade, A.D. 1099 Maturity, 1,041 years. Beyond this stage, growth is slow, producing an average of 43 annual rings per inch. Landing of the Pilgrims, A.D. 1620 Old Age, 1,562 years. The perfect top characteristic of maturity becomes broken in old age, from centuries of storms and fires. Dr. Ellsworth Huntington, of Yale University, made a study of the rings of the stumps of some big trees in Converse Basin, where they had been lumbered. 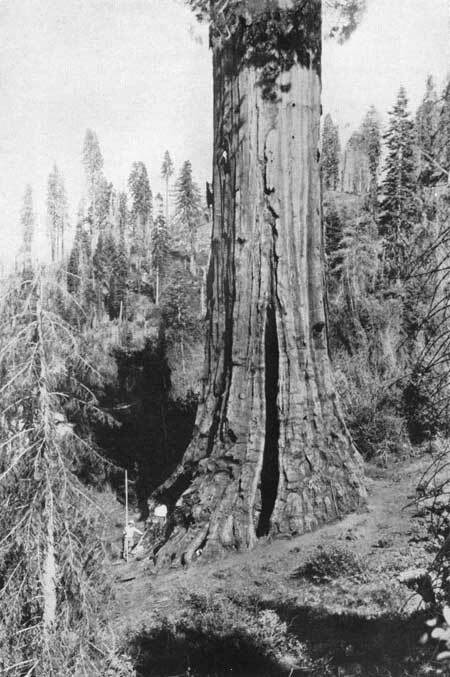 In the pamphlet, The Secret of the Big Trees, he gives the following facts concerning the age of Sierra Redwood: "How old the oldest trees may be is not yet certain, but I have counted the rings of 79 that were over 2,000 years of age, and of 4 that were over 3,000 years, one of which was 3,150." Dr. Jepson states that the oldest tree whose age has been accurately determined (within minor limits of error) is 3,226 years. More recently Dr. Douglas, of the University of Arizona, made a boring in the General Sherman tree, and, although unable to make an accurate count, he considers the tree to be more than 3,500 years old. John Muir said that he found a tree stump which, when the rings were counted and estimated, showed an age of 4,000 years. It has been impossible to locate the stump which Muir mentioned, and many do not consider the record authentic. The General Sherman and the President, of Sequoia National Park, and the Grizzly Giant, of Yosemite National Park, are usually considered the oldest trees of their kind. Of these three, it is difficult to say which is the oldest; many believe it is the Grizzly Giant. From the foregoing, we feel safe in saying that there are thousands of Sierra Redwoods between 2,000 and 3,000 years old. Certainly, a number of them are more than 3,000 years old, and a few are possibly as much as 4,000 years old. Published statements giving ages of from 8,000 to 10,000 years are greatly exaggerated.